Since its rise as a top priority for the seafood industry, the global fight against illegal, unreported and unregulated (IUU) fishing has been focused the efforts and changes being made by multinational fishing and seafood companies. 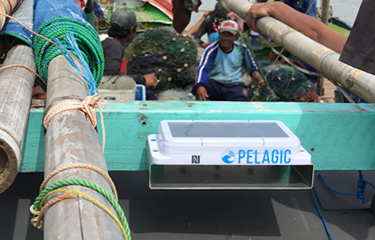 But Pelagic Data Systems (PDS), a Silicon Valley start-up based in San Francisco, California, early on recognized that the fight against IUU would be won or lost amongst small-scale fishing craft, which account for 95 percent of the world’s fishing fleet. In response, PDS created a lightweight vessel tracking system specifically optimized for use on small vessels. It differs from the Automatic Identification System (AIS) and the Vessel Monitoring System (VMS) in that those systems utilize VHS radio or satellite signals, while the Pelagic system stores data until it comes within range of a cellphone signal, which the system then uses to send the data. Additionally, the pelagic system is solar-powered, while the former requires an onboard power supply. And perhaps most importantly, it is a low-cost passive system suitable for small-scale, artisanal fishers. Pelagic Data Systems CEO Dave Solomon and the company’s chief scientific officer, Melissa Garren, told SeafoodSource the PDS was honored with the award. PDS now works in more than 20 countries across the globe, spanning an enormous range of social-political and environmental contexts. The company has partnered with Real Good Fish, a community supported fishery that makes weekly deliveries of locally caught seafood to about 1,500 shareholders in the Monterey and San Francisco Bay areas. The partnership provides Real Good Fish’s members detailed information about where, when, and how their seafood was caught, via a weekly email newsletter. Recently, PDS was recognized by the National Geographic Society for its innovative and leading efforts in the marine protection arena. Solomon said his hope in winning the award is that it leads to greater global adoption of PDS technology.